By jrosenhouse on June 1, 2016. Time for the big finale. The Monday morning game. Since I had already requested a bye for the final round, this was my last chance to make a respectable result. Here's how it went down. I was playing black. My opponent sported a rating of 1983. But he also had a formidable Russian name, and I figure that counts for another fifty points. He opened with 1. Nf3. Cagey! You're not quite sure what you're going to get with this. Maybe an English. Maybe a Reti. Maybe a transposition into a standard d4 or e4 opening. I decided to steer the game toward my normal Orthodox Queen's Gambit, and the first few moves were 1. ... d5 2. c4 e6 3. e3 Nf6 4. Nc3 c6, with our first interesting moment. White to play. Moves like 8. d4 and 8. Be2 are certainly reasonable, and I expected one of those. But my opponent had different ideas. Only eight moves in and he decided to go for glory with 8. Rg1. Gosh, what could his plan be? 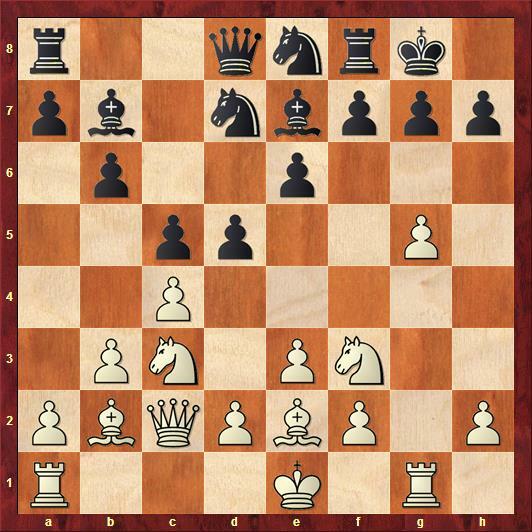 Actually, the computer is generally supportive of white pushing the g-pawn, but suggests h3 as a better way of preparing it. White to play, again. Black is threatening to get some play on the queenside with something like dxc4 followed by Nd6. 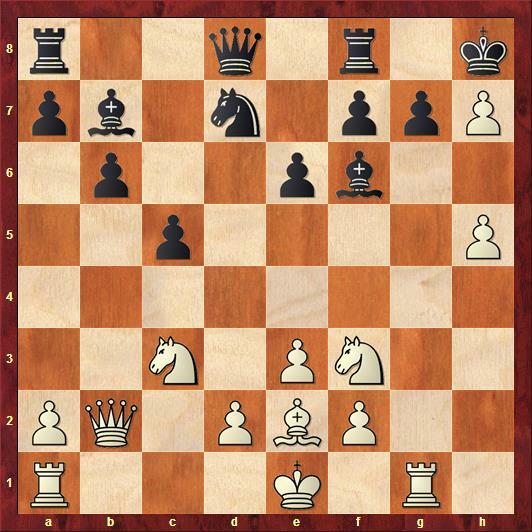 The point is that the c-pawn will then be hanging since after Nxc4, Bxc4, white's knight on f3 will be hanging to the bishop on b7. Around here I was starting to feel confident. I just didn't see much of an attack at all for white. He's effectively a pawn down, since the button on h7 is likely to fall. Playing h6 is not really a threat, since black can always reply with g6. 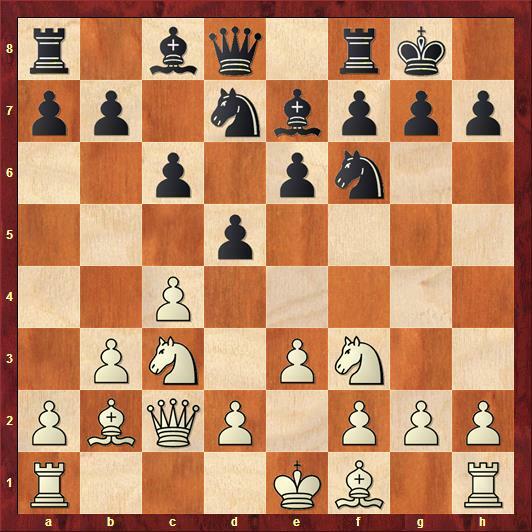 White would have to double rooks on the g-file, move his queen back to c2, and then maybe hope a sac materializes on g6. But that was all many moves away if it was possible do it at all. And here I went in for a big think. I ultimately decided on 20. ... Qf6. The computer likes this, but also suggests Qd6 as possibly stronger. I wasn't worried about 21. Ne4 by white, since 21. ... Qf5 seemed like a strong reply. (White could not then play 22. Bd3 because of 22. ... c4.) 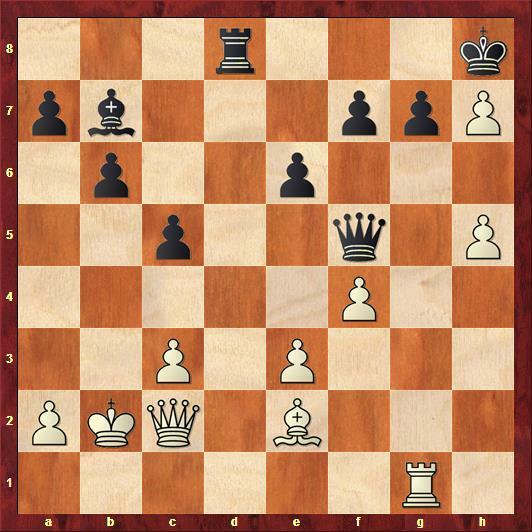 The reason for the long think was the possibility of 21. f4, which is what white played. 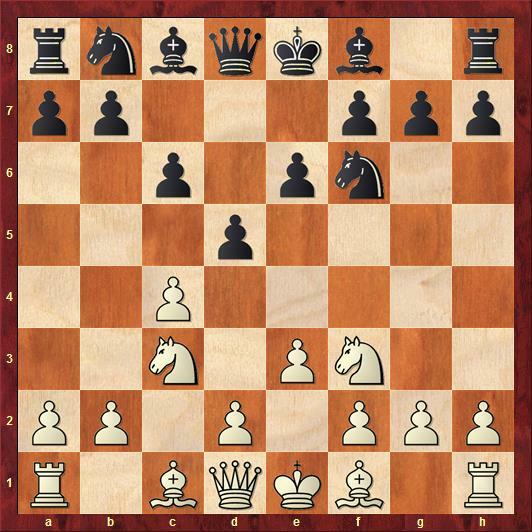 The point of the Qf6 move was to meet f4 by trading the knight on c3. Each piece trade diminished white's attacking potential. 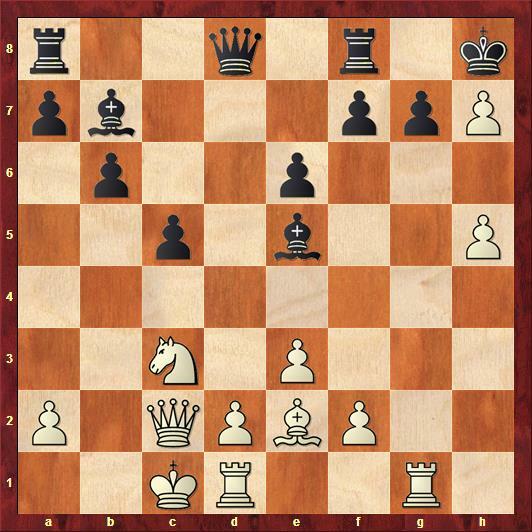 Also, since white would surely want to avoid the trade of queens, he would have to take back with the d-pawn. This would leave him with a very compromised pawn structure. That's the good news. The bad news is that it meant giving up my dark-square bishop, which seemed like a very strong defensive piece. I was reluctant to do that. One of the reasons I was so not worried about attacks on g7 was that my bishop had it covered. Was I willing to give that up? Yes I was! Play now continued 21. ... Bxc3 22. dxc3 Rad8 23. Kb2. I'm actually unsure about the point of this move, but the computer suggests it as one of white's best options. And now 23. ... Rxd1 24. Rxd1 Rd8 25. Rg1 Qf5 leading to this position. It seemed to me that this effectively forced the queen trade, and with it the last ghost of any kingside attack for white. White cannot avoid the queen trade, since any queen move will be met by Be4 and very quickly it is black who is generating the attacks. White went in for a big think here. I was mulling over the endgame after the queen trade. Is it winning for black? White will be a down a pawn with a weak pawn structure, and black's pieces will have little trouble finding active posts. So I was feeling good. But the game would be far from over. The computer evaluation is that black has a clear advantage, but the machine is not yet ready to call it winning. But white didn't play the queen trade. He emerged from his big think by playing 26. Bd3. I played 26. ... Qxd3. My opponent groaned, mulled it over for thirty seconds or so, and then resigned. The computer churlishly suggests that taking with the rook was actually stronger than taking with the queen. So there you go! Rating wise, that win cancelled out the draw against the little kid in the previous round. Overall, my quick calculation says I should gain about...three rating points. I'll take 'em! Interestingly, I went 2.5/3 against people in my rating class. But the two draws against the lower rated players knocked me down a peg. And I see you finished tied for seventh in a 44-player field. Your natural modesty keeps you from mentioning that you tied with Bobby Fischer (on a re-entry). For real. Robert J. Fischer. Anyhow. Certainly seems to me that you've kept your game going remarkably well considering the long layoffs. I hope you can find the time in the near future to play another tournament or two and climb to 2000. And thanks for posting these games. Your comments are always great! And speaking of Memorial Day results..... Jon Edwards finished in a 3-way tie for first in the 2016 US Amateur East individual tourney with 4 win, 2 draws. Princeton Chess Club marches on!
" Each piece trade diminished white’s attacking potential. Oops. Somehow I clicked on Submit too quickly. "Each piece trade diminished white’s attacking potential." That's an inaccurate principle. As an attacker I quite often have exchanged pieces exactly to increase my attacking potential. What matters is the activity of the exchanged pieces. Exchanging a very active piece for a passive piece is a very bad idea when conducting a defense. Your opponent missed a few interesting options. He could have accelerated his attack with 10.g5 Ne8 11.h4 e5 12.h5 as its not clear that the bishop should go to e2. A bit further he had 15.Bxc4 (which gives rise to the question why 10.Be2) Bxf3 16.Bd3 Bxg5 17.Ne4 Bxe4 18.Bxe4 Rb8 19.Bxh7+ Kh8 20.h6! Bxh6 21.Rh1. 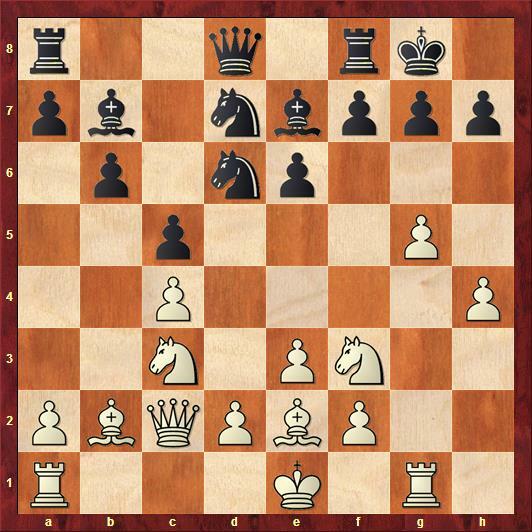 "Has black’s play been so poor that this sort of primitive kingside attack can work?" To some extent yes. That queen's bishop of yours is a lame piece at move 8 and not that much better at move 10. Hence White has a lot of tempi available to initiate something dangerous. Thanks for directing me to the fact that the standings had been posted. Turns out I won 75 dollars! Whoo hoo! That just about covers the books I bought between rounds. Assuming the check is in the mail, of course. Incidentally, that 1400 rated kid who drew me in round four (and who beat someone rated 1980 earlier) drew an expert in one of the later rounds. See what I mean about kids often being underrated? Black puts up with a bad queen bishop in a lot of openings. I'm not sure it's an invitation to a an all-out pawn storm so early in the game. But you're probably right that white could have prosecuted the attack more vigorously. For what it's worth, the computer did not think white ever had anything more than the standard small advantage.
" I’m not sure ...."
The idea of initiating such a storm is fairly common - in openings with less bad queen bishops than yours. Keres Attack in the Scheveningen (move 6) is one example. In your case I didn't claim even that standard small advantage though. It's just one way to play for a win by complicating the game. My opponent sported a rating of 1983. But he also had a formidable Russian name, and I figure that counts for another fifty points. Hmm. It suddenly occurs to me to ask a question: isn't it a bit strange that the Professor of Mathematics who has written a book on the math of Sudoku and another on the math of the Monty Hall problem, and who is an avid chess player to boot, hasn't thought of writing a book on the math of the chess ranking system and how it influences the game? Oh well...knowing chess players, the answer is probably "because there are 50 of those books already." I don't know if there is a whole book, but there is certainly a lot of scholarly writing on the subject of devising rating systems for games like chess. The fellow who came up with the system currently in use, Arpad Elo, was actually a physicist. There's nothing specific to chess in the current system. It can as easily be used for lots of different games. A book about chess and mathematics more generally could be fun. There is this article by Elkies and Stanley, that the authors said they would expand into a book. I don't know what ever happened to that, however. Elkies also has this interesting article about combinatorial chess problems. Incidentally, the tournament has now been rated, and it turned out my haul was not three points, but five! That brings me up to 1974. Now we're cooking with gas! And it turns out that 1400 rated kid was only provisionally rated. After the even he's up into the 1700s, and I wouldn't be surprised if he's still underrated.